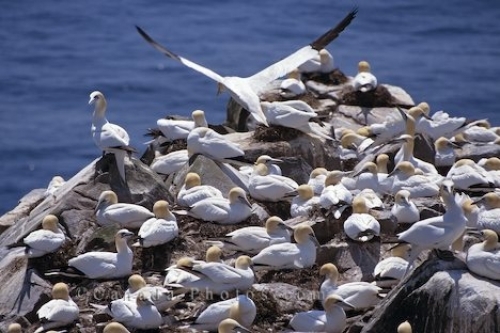 Gannets nesting on Bird Rock at Cape St Mary's Ecological Reserve in Newfoundland, Canada. Thousands of Gannets nest on Bird Rock in the Avalon Peninsula at Cape St Mary's Ecological Reserve in Newfoundland, Canada during the months of April through June. The Gannets seem to like Bird Rock which is a 100 meter tall rock made of sandstone. Gannets nesting on Bird Rock, Cape St Mary's Ecological Reserve, Newfoundland, Avalon Peninsula, Canada. Picture of a colony of Gannets at the Cape St Marys Ecological Reserve in Newfoundland, Canada.